CANTON, OH. 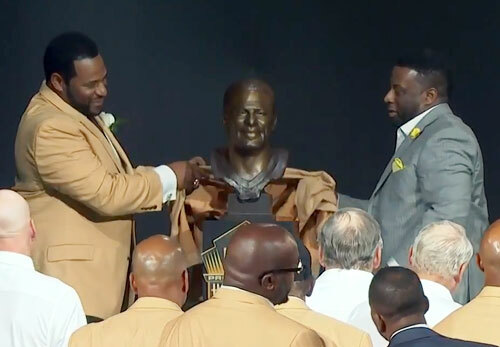 — Pittsburgh Steelers running back Jerome Bettis headlined the Pro Football Hall of Fame Class of 2015 as he gave his Pro Football Hall of fame induction speech, turning the event into a Steelers rally. As Bettis grabbed one of the famous ‘terrible towels’ synonymous with the franchise at the beginning of his speech, he led a chant of “Here We Go Steelers, Here We Go” to a capacity crowd at Tom Benson Stadium. Source: FoxNewsSports. Bettis wasn’t shy about his desire to follow in the footsteps of other Steeler greats already in the Hall. Many were on hand to watch, including Franco Harris, Joe Greene and Lynn Swann. 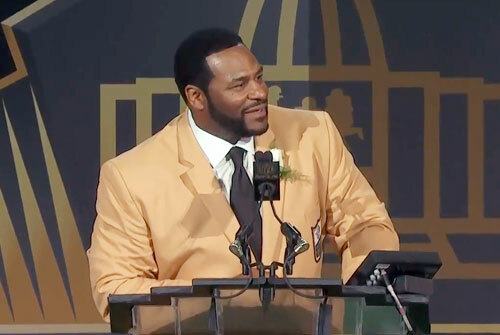 Several of Bettis’ former teammates, including quarterback Ben Roethlisberger and wide receiver Hines Ward, sat in front of the stage as the Hall’s doors finally opened for the player known simply as “The Bus.” “I really thought the Bus’ last stop was in Detroit at Super Bowl 40,” Bettis said. “But now I know the Bus will always and forever run in Canton, Ohio. Sports Speakers 360 is a booking agent for motivational sports speakers. If you would like to book pro athletes or NFL stars like Jerome Bettis for a speaking engagement or appearance, please contact Jerome Bettis’ booking agent for speaker fee information. For details on how to hire Pittsburgh Steelers players for appearances, call 1.855.303.5450.